What have been seen so far…?? #As the India plate continued to move towards the north, and collided with Eurasian plate; Kangleipak emerged out of the oceanic water during the Eocene epoch (65-34 million years ago) with the mountain “Koubru” firstly emerged along with its ranges surrounding the present Imphal valley. Therefore, Kangleipak is sometimes described as “Eeronnungi Mani (Yai)” and hence – “Yoimayai Khunda Ahanba”. 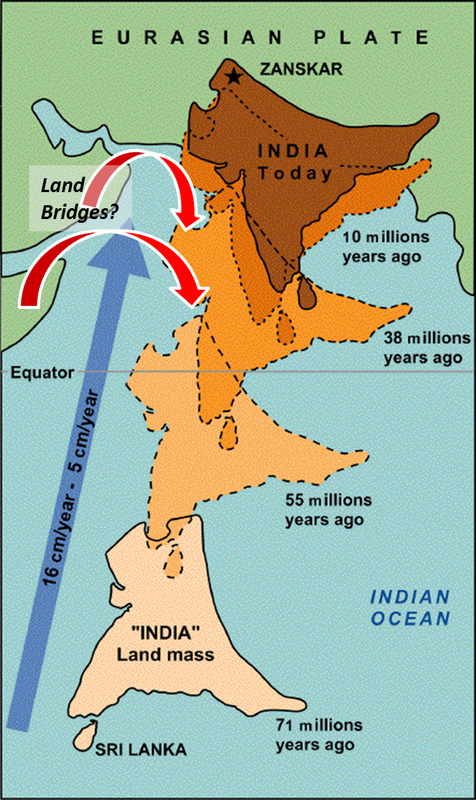 Thus, Kangleipak become into existence around 50 million years ago during the Eocene epoch. ##The Lai people or the Leima Lai people were the human beings who were inhabiting on the tops of the present Koubru Mountain and its ranges surrounding the present Imphal valley, once full of fresh water as an inland sea. Thus, the place Koubru was(is) the cradle of the first human race called Lai and Meetei race is progeny of Lai race and hence – “Leimalai khunda ahanba”. 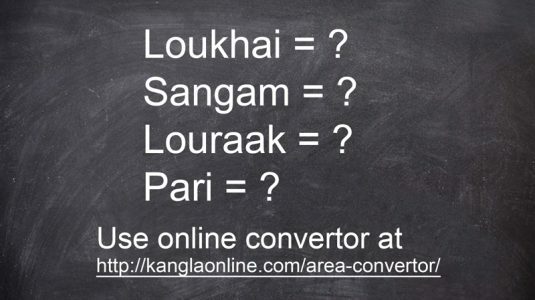 Therefore, Meeteis are also known as Laigi Macha and Meetei Leipak is called Laileipak (Laireipak). Is it a Tip of the Iceberg…?? However, today’s subject is different from the above as well as from above meaning! And is there any other subtle Science in the verse particularly in the triplet “Awang Koubru Asuppa” is the focus of today! The answer is – YES, which takes the Meetei race on the zenith of philosophy & science. The meaning is like this & is outcome of humble mind and it is left to the learned readers to take a call….!!! The words “Awang Koubru Asuppa” had buckled the mind and started thinking why all are together that Awang (North), Koubru (North West), and then Asuppa (Together or Common). All the directions – N & NW are independent and what is common to both North & North West!!! And is it really related to evolution..??? We’ve already unraveled the meaning of the puya verse Malem Leikoi Poong as “Malem Leikoipung = malem + lei + koi + pung = malem (earth) + lei (rotates) + koi (revolves) + pung (spheroid); which indicates that the Earth Rotates about its own axis, Revolves round the Sun and the shape of the Earth is like a Poong (Oblate Spheroid). Now, the next immediate question is what about the Axis of Earth’s rotation (Spin Axis) and where does the Axis stand…??? Does the answer sought contain in the another Puya verse “Awang Koubru Asuppa ?? ?” This is the beauty of the Meetei Verse – “Awang Koubru Asuppa….!! !” Please have a look. What Science Says…?? 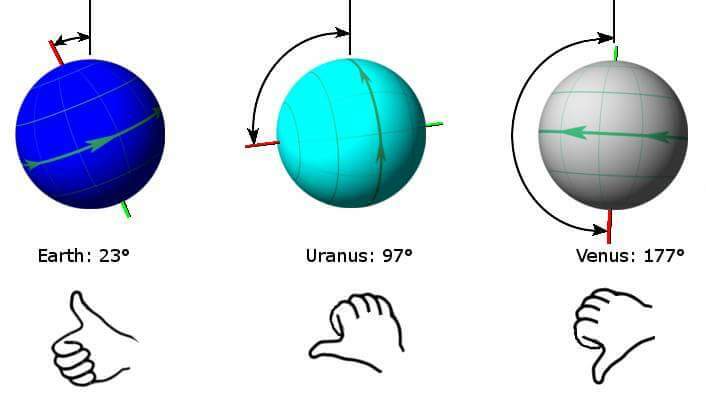 The North Pole of a planet is defined by the right-hand rule: if the fingers of the right hand are curled in the direction of the rotation then the thumb points to the positive pole. The tilting of the Axis of the rotation or Spin Axis of a planet or axial tilt called Obliquity is defined as the angle between the direction of the positive pole and the normal to the orbital plane. In the solar system, there is no planet whose spin axis is not tilted. Even Sun’s axis is tilted. And probably, all exo-planets in the universe have tilted spin axis. However, Were the Spin axes straight even for earth too? How was Spin Axis of the Earth (and others) tilted? What happened from straight axis to tilted axis? Let’s look at understanding of Science and that science in Meetei Puya (Philosophy). The Earth’s axis of rotation or Spin Axis is not straight, not perpendicular to the plane of rotation and tilted to some degrees since the formation of the solar systems i.e. ~ 4.5 billion years ago. At present, the axis is tilted 23.5° from the vertical, but it is not fixed. This axis angle (Obliquity of earth) varies, from 22.1° to 24.5° over a period of 41,000 years called Milankovitch Cycle. The current tilt is 23.5°, roughly halfway between its extreme values. The tilt last reached its maximum in 8,700 BCE. Currently Earth is in its fourth Quarter of Milankovitch Cycle and is decreasing at a rate of 0.013 degree per Century. It will reach its lowest to 22.1 Degrees in about 11,800 years. The Obliquity angles for all other planets in solar system are different. For Uranus and Venus, tilting angles are approximately 97°, and 177° respectively. Interestingly, due to variations in their obliquity angles, with respect to earth – Sun rises in the West & sets in the East on Venus, Sun rises in the North & sets in the South on Uranus. Spinning of Earth and tilting of the Spin Axis came about early in the formation of the solar system, 4.5 billion years ago and is a result of the history of the planet. The solar system started out as a large cloud of gas and dust called a nebula. This cloud was not uniform so when it started to collapse because of gravity, it didn’t collapse evenly and it started to rotate gaining angular momentum. As it collapsed more and more the rotation increased (more angular momentum), much like a figure skater increases her spin by drawing in her arms. The central portion eventually formed the sun. Around the sun, other parts of the protoplanetary disk of cloud began to condense and form small bodies called planetesimals. As these planetesimals moved around the sun, they gathered more and more material until they reached the size they are today. They were already moving around the sun in orbits and probably had some spin from the collapse of the original nebula. The Earth (in fact all planets) is a top, and all large bodies out there with a spin, will continue to spin until something slows them down. In the case of the top on floor, the friction with the floor, and with air around the top, slowed it enough for it to fall over. The Earth has nothing to slow it. Earth is not slowing down in its rate of spin. That is Planets are born with some amount of angular momentum, and angular momentum must be conserved. The only way for the angular momentum to change is through interactions with other bodies. In interactions, total angular momentum is conserved, but may be exchanged between different bodies. Throughout the history of a planet, it may have many gravitational interactions which affect its obliquity. The obliquity (tilting of Spin axis) is a result of the history of all of those Gravitational Interactions. This is origin of Spin and obliquity of Planets as per science. The Giant Impact Theory is the best known theory for Obliquity of Earth. Prior to the giant impact, the earth spun on a perfect straight axis means there was no tilting of spin axis. 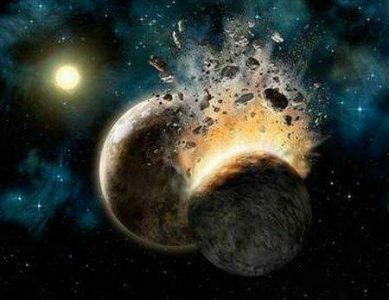 Astronomers theorize that over 4.5 billion years ago, “Theia” a plenetisimal about the size of Mars, collided with Earth to create a tilted axis. An impact above the equator changes the rotational axis and speed. Following the Giant impact, Earth ended up with an axis tilt. This is the origin of Obiquity of earth’s spin axis as per science. At present, the axis is tilted 23.5° from the vertical, but it is not fixed. This tilt angle (Obliquity) oscillates between 22.1° to 24.5° over a period of 41,000 years. The reason for this changing obliquity angle is that Earth’s axis also wobbles (Precession) around itself. A complete wobble of Earth’s axis takes around 26,000 years. 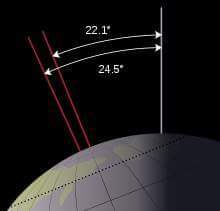 The North Star changes because of precession (wobble). 13,000 years ago, the North Star was Vega; currently, the North Star is Polaris. 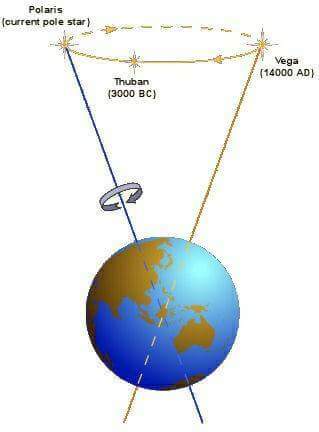 The North Star has changed over the past 13,000 years, and in another 13,000 years it will switch back to Vega again. Earth’s obliquity may have been reasonably accurately measured as early as 1100 BC in India and China. The ancient Greeks had good measurements of the obliquity since about 350 BC. About 830 AD, the Caliph Al-Mamun of Baghdad measured the obliquity. In 1437, Ulugh Beg determined the Earth’s axial tilt as 23.5047°. What Meetei Puya says….?? Now, let’s look at the Philosophy. From immemorial time in the Meetei Race Kangleipak, there is chronicle called “Nongkhong Koiba (Racing around the World or Universe)”, in which – when Salailen Sitapa (Ipa Sorarel) become aged, one day Salailel Sitapa called His two sons – Sanamahi & Konchin Tukthaba and told them that as He became old, He wanted to give His fampan (seat of Kingship /throne) to one of them. “Any one of you, who can go round the Nongkhong will get the Fampan”. Powerful Sanamahi went immediately to go round the Nongkhong (Earth or Universe). While weak Konchin Tukthaba made 7 rounds of Fampan Fangkhong of His father Salailel Sitapa and got the Fampan (seat of kingship) and also epithet of Pakhangba, from His father Salailel Sitapa, before came back of Sanamahi who went round the Nongkhong. However, when Sanamahi came back, He was not happy with decision of His father of granting His fampan to Pakhangba. Thus, Sanamahi who is actually Eepung Loinaba Apakpa or Tingpalpa Mapu, the Universal God father, the creator of the earth ( universe) and who has incarnated just as a child to Salailel Sitapa to create Human beings, had thought of destroying the Earth (Universe) as He was not satisfied with the end result of Nongkhong Koiba. Thus, Sanamahi Kicked down the Earth so vigorously with the intention of destroying it, and in this act of God, earth got tilted that is direction of True North got changed. Which means that earlier, North was pointing North i.e. Spin Axis was straight pointing at North as Science found it. Also, Sanamahi Kicked vigorously is equivalent to that there was a Giant Impact as Science told and also Kicked Down means that North (Awang) was moved downwards towards South through South West (Koubru), as a result of which North (Awang) has changed towards North West (Koubru), which actually means that Earth got Tilted Spin Axis (Obliquity). Also, since Kangleipak is above the equator, the giant impact (kick) might be above the equator as science theorized and caused the tilt of the axis. However, how much is tilted by what degree!!! The Meetei Puya Triplet “Awang Koubru Asuppa” subtly means that “Awang Su Oire Koubru Su Oire Animakpu Suppe” that is “It is also North-Awang (0 degree) and it is also North West-Koubru (45 degrees) and it is common to both that is mean of 0 degree & 45 degrees = 22.5 degrees, that is the angle at which Earth’s Spin Axis points as per Meetei Puya. The value of 22.5 degrees is within the range of 22.1 degrees & 24.5 degrees of Spin Axis as per Milankovitch Cycle and very close to the present value of 23.5 degrees as per Science. Also, since due to the vigorous kick (giant impact), the entire fabric of the space-time might have got disturbed changing the gravitational forces of interaction of all the planets and all the planets might have got tilted axes. Also, since the Nongkhong Koiba tradition is before the advent of Sanamahi creating the Beings, definitely it must be at the beginning of the evolution of the earth i.e. around 4.5 billion years old. That is, tilting of earth’s spin axis might be related to the history of planet i.e. 4.5 billion years ago. Discovered tip of the Ice berg..!! the Puya verse “Awang Koubru Asuppa” means that – “Awang Oina Leijarambadu Koubru Romda Chepthakhi/Peithakhi, Aduna Awangsu Oire Koubru Su Oire Animak Suple Haibani”. The rough English translation is “The then north has got tilted towards north-west and it has become north as well north-west”. Thus, verse “Awang Koubru Asuppa” has everything about science of Obliquity of Earth – about its origin of Tilt, by 22.5 degrees (Milankovitch range) , due it Giant Impact of Theia (Kick) and timeline of tilt ~4.5 billion years (Nongkhong Koiba). What a great Philosophy of Puya of Meetei race of Kangleipak !!! Wow just simply wow! Great Sir Raghu. Thank you for your valuable topic that you enlighten us, Please write more, Sir gumbase atangbani ekhoigi. Thank you my brother for such valuable and amazing article. You are one of the Manis of our Manipur. I’m really feel proud of you always. And thanks again for sparing your precious time for enlightening our horizon of knowledge. Hope you will continue your modus operandi on eye-opener topics. God bless you all the time. Very profound and enlightening article with scientific illustration of earth’s evolution highlighting the capabilities of our Indian natives and ancestors. Thanks Raghu Ningthoujam for your effort to unearth subtle insights of our ancient verses. Dear, Dr. Raghu Ningthoujam, your article which is proving the highest philosophical Concepts of Sanamahi followers and Meetei people shows that every phrase or paragraph of our forefathers PUYA or says are very important. We should keep on interpreting like the way you did. We need more scholars like you who can contribute to Malem Leishemba and Meeoiba Semba evolutionary ideas based on the geological formations and Meetei and its associated communities settle in the Kangleipak and it’s surroundings. The very basic ideas within our forefather need to exposed and published in the international level so that our forefather says “Hanna Houba Konna Loiba” we were born first as human race and we will also be the last valuable race on this earth as people will learn from our ideas. So, the scientific based philosophy are still hiding with us which need to be protected and explored to this world. I am very much thankful to you for this valuable article on planetary ideas of Meetei people existing since 3000 yrs. Hope many Western World scientific research scholars will be visiting our home to explore more concepts if we published in international journals and books. So, let’s join in hand to know more about surface and subsurface of earth along with its planetary ideas. Well mentioned with deep findings please do more research on Puya with scientific methods. I’m proud of you my friend. It is a hair-raising read of the article so intricately knitted by my friend Shri Raghu Ningthoujam as a sequel of his writing spree on science and philosophy of meetei puya. Also, felt lovely that how much brainy and visionary our forefathers were !! Feeling the pride as Meetei that we are the descendants of those great forefathers. Hope one day our history will see the light of the day soon. Kudos to my dear friend Raghu. Valuable and mind-blowing masterpiece ! We need to discover more and more science behind the Puya. We are expecting more from such young and dynamic scientist of ISRO. Shri Raghu Ningthoujam will open all pages and enlighten us – a great scientific philosophia of Puya !